Whether a child or young adult is coping with learning and behavioral issues associated with Autism Spectrum Disorders or a student needs extra help with academics, behavior, and social interactions, the Vista School is committed to implementing an individualized plan for learning that will maximize the potential for every child. The elementary program provides the small class size and high student-teacher ratio that will help youngsters progress and consolidate gains in academics, social interaction, and behavior. The needs of every student in this nurturing program are known by all staff to ensure your child gets the attention they need to succeed. Elementary school students participate in a range of activities on our 18-acre campus beyond academics, including arts enrichment, instrumental music instruction, art, swimming in our indoor heated pool, and physical education like basketball, tennis, and other sports. As children with behavioral and social challenges grow into adolescents, they get the structure and support they need through the Middle and High School. The small class sizes help students continue their academic and social growth, while a more autonomous schedule and elective classes help them establish independence. Older students in our Middle and High Schools take all required academic courses including science in our new lab. They also select from a series of elective activities including swimming, sports, gardening, woodshop, ceramics, performing arts, and instrumental music instruction. We are dedicated to ensuring that when students leave our school, they’re prepared both academically and socially. Students in the adult division receive additional vocational, social, and independent living skills before moving beyond high school. This alternative track involves transitional programs like our eBay program, involvement with neighborhood activities, and real-life work opportunities. 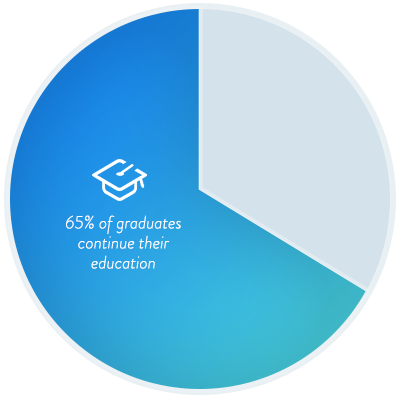 Over the past several years, more than 65% of our graduates have enrolled in college, community college, paraprofessional training, or vocational school. The admissions process includes a tour of the facilities and program orientation, submission of an application, interview with family and child, and review of applicable records by the Director of Education. The Vista School is successful because we believe that each student has immense potential. Our staff recognizes that all students have a right to be here, and encourage students to both continually learn and grow.